University of Bridgeport College of Chiropractic. Low back pain is a common complaint in pregnancy, with a reported prevalence of 57% to 69% and incidence of 61%. Although such pain can result in significant disability, it has been shown that as few as 32% of women report symptoms to their prenatal provider, and only 25% of providers recommend treatment. Chiropractors sometimes manage low back pain in pregnant women; however, scarce data exist regarding such treatment. This retrospective case series was undertaken to describe the results of a group of pregnant women with low back pain who underwent chiropractic treatment including spinal manipulation. Seventeen cases met all inclusion criteria. The overall group average Numerical Rating Scale pain score decreased from 5.9 (range 2-10) at initial presentation to 1.5 (range 0-5) at termination of care. Sixteen of 17 (94.1%) cases demonstrated clinically important improvement. The average time to initial clinically important pain relief was 4.5 (range 0-13) days after initial presentation, and the average number of visits undergone up to that point was 1.8 (range 1-5). No adverse effects were reported in any of the 17 cases. The results suggest that chiropractic treatment was safe in these cases and support the hypothesis that it may be effective for reducing pain intensity. Chiropractic treatment includes many therapeutic options, as outlined in Table 1. Spinal manipulation is typically considered the defining element of chiropractic practice. There is reasonable evidence supporting the safety and effectiveness of spinal manipulation for low back pain,  neck pain,  and chronic/recurrent headaches. However, at present, there is only minimal evidence on the safety and effectiveness of spinal manipulation along with other alternative therapies for pregnant women. [3, 15] Scarce outcomes data on any chiropractic treatment of low back pain of pregnancy have been presented in the peer-reviewed literature. Two retrospective case series [19, 20] and one case report  describe pain reduction in the majority of cases; however, all three reports have methodological limitations. Particularly unclear is the role of spinal manipulation, the chiropractic treatment method presently supported by the most evidence of safety and effectiveness for general low back pain. It has often been written that low back spinal manipulation should be avoided in low back pain of pregnancy cases, [23, 24] but no data have been presented to support this finding. The purpose of this study, therefore, is to describe the response of a group of consecutive cases of women with low back pain of pregnancy who underwent chiropractic care including spinal manipulation. This study is a retrospective case series (Level IV Evidence) and was approved by the Institutional Review Board of the University of Bridgeport College of Chiropractic. All cases of pregnant women presenting for chiropractic treatment to the author’s private practice in San Francisco, California, during 12 consecutive months were reviewed. Cases were retrieved by a search of the practice’s electronic database for instances of the ICD code V22.2 (pregnancy, incidental). The charts of these women were then reviewed for the following inclusion criteria: pregnant woman; complaint of low back pain; use of the 11-point Numerical Pain-Rating Scale, a pain measure of established reliability and validity,  by every woman at each visit; consistent description of treatments used; clear description of treatment frequency and duration; and clear description of occurrence or lack of adverse effects. All records were reviewed by the author, and no identifiable subject information was disclosed during any part of this project. Data were extracted from charts that met the above inclusion criteria and were entered into a spreadsheet (Microsoft Excel) for tabulation. Diagnostic work-up included standard history and physical examination with regional orthopedic and neurological testing. All women were screened for signs and symptoms of serious pathology (fracture, malignancy, infection, cauda equina syndrome) presenting as low back pain. All women were treated by the same clinician. Active care consisted of reassurance and education, advice on body mechanics, and exercise instruction. Passive treatments were manual myofascial release, manual joint mobilization, and manual spinal manipulation. The most commonly used spinal manipulation maneuvers were procedures aimed at the lumbar facet joints and/or the sacroiliac joints. This involves the subject lying in the lateral decubitus position with the hip and knee flexed, upper extremities folded, and forearms resting on the chest. The chiropractor stands facing the subject at approximately a 45° angle to the table. The chiropractor contacts the given region of the subject’s spine with the hypothenar region of one hand; the other hand contacts the subject’s crossed forearms. At first, relatively low offsetting forces are applied to bring the spinal region to the end range of passive motion. Next, the high-velocity, low-amplitude thrust is delivered. These procedures have been well described elsewhere. For the women in this study, modifications in technique delivery were made to ensure comfort and avoid abdominal compression; and the clinician attempted to use the lowest amount of force necessary. However, the goal of each spinal manipulation procedure was grade V joint motion and articular cavitation or “popping,” and this occurred in most instances. The electronic search yielded 18 cases. On review, one was a case of headache and neck pain without low back pain and, therefore, was excluded. The remaining 17 were cases of low back pain. Of these, 8 complained of local pain at some point between the lowest rib and the gluteal fold; 5 had pain radiating to the posterior thigh; 2 to the inguinal region; and 2 to the posterior calf. In all women, straight leg raise testing was negative, and lower extremity motor strength, deep tendon reflexes, and sensation were intact. These 17 cases met all inclusion criteria and were analyzed. Baseline characteristics of these women are described in Table 2. Of these 17 women, 8 were self-referred, 7 were referred by obstetricians, and 2 by midwives. The overall group mean Numerical Pain-Rating Scale score decreased from 5.9 (range 2–10) at initial presentation to 1.5 (range 0 –5) at termination of care. When considered individually, one of the 17 (5.8%) women did not demonstrate any clinically important improvement. For the Numerical Pain-Rating Scale, this has been reported to be a decrease of 2 or more points. After eight visits in 21 days, the Numerical Pain-Rating Scale score in this woman changed from 6 to 5. The remaining 16 of 17 (94.1%) women demonstrated clinically important improvement. The average time to initial clinically important pain relief was 4.5 (range 0–13) days after initial presentation, and the average number of visits undergone up to that point was 1.8 (range 1–5). At termination of care, the average Numerical Pain- Rating Scale score for these 16 women was 1.3 (range 1–4). The average time to termination of care was 24.4 days (range 5–62) after initial presentation, and the average number of total visits undergone was 5.6 (range 3–15). During the course of care, all women were questioned about the occurrence of adverse effects. None of the 17 women reported any adverse effects. Whether low back pain of pregnancy is a unique pathology or is simply the occurrence of mechanical spinal pain during pregnancy remains controversial. [7, 9] Present understanding of the etiology of low back pain in pregnant women is as limited as the understanding of the etiology of low back pain in nonpregnant individuals. However, it is clear that many pregnant women suffer from low back pain, the pain can be severe and disabling in some, and a large proportion of cases go untreated. Chiropractic treatment including spinal manipulation is sometimes used for pregnant women with low back pain. Currently, the mechanism of action of spinal manipulation is poorly understood. However, basic science studies have shown that manipulation results in increased joint range of motion,  modulated joint kinematics,  regional hypoalgesia,  and altered muscle tone. Therefore, patients may benefit from increased joint motion and/or decreased joint or muscle pain. This may be relevant to low back pain of pregnancy, because preliminary evidence suggests that asymmetric stiffness of the sacroiliac joints is related to the presence of low back pain in pregnant women. This retrospective case series presents outcome data on chiropractic treatment for women with low back pain of pregnancy. Yet, this is low level evidence, and there are limitations inherent in this study design. No conclusions on effectiveness can be drawn from any case series. However, because no adverse effects occurred during the treatment period, this work does provide preliminary evidence that chiropractic treatment was safe for this group of women. About half of the women in this study were referred by prenatal providers, and half were self-referred. However, comparisons of expectations and outcomes of either group cannot be made because of the small number of subjects. In addition, multiple treatments were used in each case. Although this is typical of chiropractic practice in the field, there was no attempt to characterize the response to any individual treatment component. Furthermore, all treatment was delivered by one provider in one private practice location. Finally, there was no attempt to follow cases beyond the termination of care; therefore, the duration of apparent pain relief is not known. Further work is needed to better understand the safety and effectiveness of chiropractic treatment for low back pain of pregnancy. A reasonable approach would be a prospective cohort study comparing two groups of women from one prenatal facility, with one group receiving chiropractic treatment and the other receiving standard medical care not involving chiropractic referral or treatment. This study described the results of chiropractic treatment including spinal manipulation for 17 women with low back pain of pregnancy. Sixteen of the 17 cases (95%) demonstrated clinically important improvement in pain intensity throughout the course of treatment. No adverse effects occurred in any of the 17 cases. The results of this study suggest that chiropractic treatment was safe in these cases and support the hypothesis that it may be effective for reducing intensity of low back pain of pregnancy. Substantial prospective work is needed to test this hypothesis. Prevalence of back pain in pregnancy. Kristiansson P, Svärdsudd K, von Schoultz B. Back pain during pregnancy: A prospective study. Wang SM, Dezinno P, Maranets I, Berman MR, Caldwell-Andrews AA, Kain ZN. Low back pain during pregnancy: Prevalence, risk factors, and outcomes. Skaggs C, Nelson M, Prather H, Gross G.
Documentation and classification of musculoskeletal pain in pregnancy. J Chiro Educ 2004; 18:83–4. Mens JMA, Vleeming A, Stoeckart R, et al. Understanding peripartum pelvic pain: Implications of a patient survey. An analysis of posture and back pain in the first and third trimesters of pregnancy. J Orthop Sports Phys Ther 1998;28:133– 8. Influence of some biomechanical factors on low back pain in pregnancy. Hirabayashi Y, Shimizu R, Fukuda H, Saitoh K, Furuse M.
Anatomical configuration of the spinal column in the supine position. II. Comparison of pregnant and non-pregnant women. 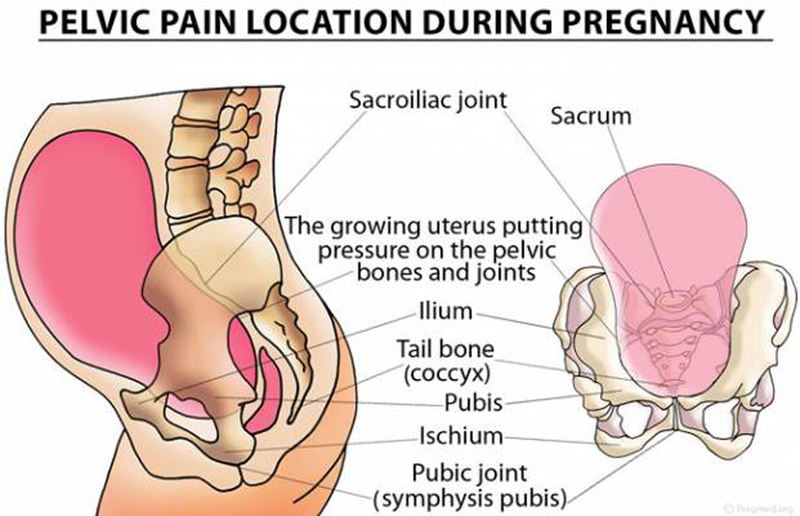 Low back pain and pelvic pain during pregnancy: Prevalence and risk factors. Damen L, Buyruk HM, Guler-Uysal F, Lotgering FK, Snijders CJ, Stam HJ. The prognostic value of asymmetric laxity of the sacroiliac joints in pregnancy-related pelvic pain. Buyruk HM, Stam HJ, Snijders CJ, Lameris JS, Holland WP, Stijnen TH. Measurement of sacroiliac joint stiffness in peripartum pelvic pain patients with Doppler imaging of vibrations (DIV). Eur J Obstet Gynecol Reprod Biol 1999;83:159–63. Coulter ID, Hurwitz EL, Adams AH, Genovese BJ, Shekelle PG. Who Are They, and Why Are They in Chiropractic Care? Christensen MG, Kerkhoff D, Kollasch MW. Greeley (CO): National Board of Chiropractic Examiners, 2000. Stapleton DB, MacLennan AH, Kristiansson P.
The prevalence of recalled low back pain during and after pregnancy: A South Australian population survey. Aust N Z J Obstet Gynaecol 2002;42:482–5. Allaire AD, Moos MK, Wells SR.
Complementary and alternative medicine in pregnancy: A survey of North Carolina certified nurse-midwives. van Tulder MW, Furlan AD, Gagnier JJ. Complementary and alternative therapies for low back pain. Best Pract Res Clin Rheumatol 2005;19:639 –54. A Cochrane review of manipulation and mobilization for mechanical neck disorders. Bronfort G, Nilsson N, Haas M, Evans R, Goldsmith CH, Assendelft WJ, Bouter LM. Non-invasive physical treatments for chronic/ recurrent headache. Cochrane Database Syst Rev 2004;3:CD001878. Spinal manipulative therapy for 12 pregnant patients suffering from low back pain. Diakow PR, Gadsby TA, Gadsby JB, Gleddie JG, Leprich DJ, Scales AM. Back pain during pregnancy and labor. J Manipulative Physiol Ther 1991;14:116–8. Diagnosis and manipulative management of post-partum back pain: a case study. J Manipulative Physiol Ther 1979;2:99 –102. Gatterman MI, Cooperstein R, Lantz C, Perle SM, Schneider MJ. Rating specific chiropractic technique procedures for common low back conditions. J Manipulative Physiol Ther 2001;24:449 –56. The female patient: Enhancing and broadening the chiropractic encounter with pregnant and postpartum patients. J Amer Chir Assoc 2003;40:18 –24. Pain measurement tools for clinical practice and research. Loads transmitted during lumbosacral SMT. Farrar JT, Berlin JA, Strom BL. Clinically important changes in acute pain outcome measures: A validation study. J Pain Symptom Manage 2003;25:406 –11. Borg-Stein J, Dugan SA, Gruber J. Am J Phys Med Rehabil 2005;84:180 –92. Stuge B, Hilde G, Vollestad N.
Physical therapy for pregnancyrelated low back and pelvic pain: A systematic review. Acta Obstet Gynecol Scand 2003;82:983–90. Nilsson N, Christensen HW, Hartvigsen J. Lasting changes in passive range of motion after spinal manipulation: A randomized, blind, controlled trial. J Manipulative Physiol Ther 1996;19:165– 8. Spinal manipulation causes variable spine kinematic and trunk muscle electromyographic responses. Herzog W, Scheele D, Conway PJ. Electromyographic responses of back and limb muscles associated with spinal manipulative therapy.